Bones is looking to cement his legacy over the next two years. 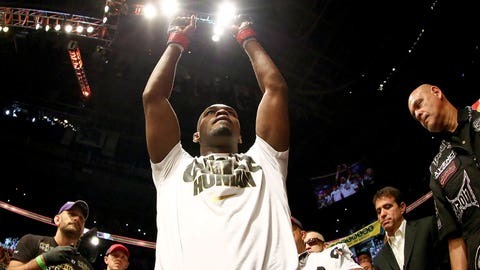 In a very short amount of time, UFC light heavyweight champion Jon Jones has started to creep up on every major record held inside the Octagon. He’s already beaten Tito Ortiz’s light heavyweight title defense streak, which he now stands alone at with six in a row. The six title defenses now puts him only four away from tying Anderson Silva’s all-time record of ten in a row, which Jones can get even closer to with a couple more wins in 2014. Jones is a goal oriented fighter so he’s not shy about admitted that he’s targeting certain landmark moments for his own career. He’s not far behind now after only winning the belt in 2011 and nothing appears to stand in his way from reaching for the top spot in UFC history by the close of 2015. "That’s in there, that’s one of the concrete ones," Jones told FOX Sports about Silva’s title defense record. "It’s going to be a lot of work and it’s going to take a long time to get there, but it’s one of them of course. "Actually breaking GSP’s record is where I’m at right now, I’m right behind him. One thing at a time and then obviously Anderson." Lately I have been kind of like re-evaluating and just figuring out, basically you always have to find your motivation. St-Pierre’s title defense record stands at nine in a row, but he’s now taken an indefinite hiatus from the sport, which obviously prevents him from going for Silva’s record any time soon. St-Pierre’s decision rattled the UFC to its core because not only was he one of the greatest champions to ever compete there, but he was also the biggest draw in terms of live audience and pay-per-view buys as well. Life got in the way. That’s probably the easiest way to describe St-Pierre’s decision to walk away as personal issues mounted and when you add the pressure that comes along with being champion day in, and day out it just got to be too much. Jones is sympathetic towards St-Pierre’s decision and admits that it’s personal for every fighter to find a reason to get up in the morning and go to the gym while trying to fill every professional obligation required of them as well. "I can totally understand where he’s coming from," Jones said about St-Pierre. "It’s a lot of work. It really is. Lately I have been kind of like re-evaluating and just figuring out, basically you always have to find your motivation." With St-Pierre gone indefinitely and Anderson Silva trying to redeem himself from a knockout loss in July that stopped his record breaking streak, Jones is quickly becoming the new face of the UFC in rapid fashion. So what’s keeping Jones on track and not feeling the weight of the world crushing down on his shoulders? My goal is just to evolve mentally and to just stay hungry and stay driven towards higher, better things," Jones said. "That’s my goal right now. Just come up with a next level way of thinking." Listen to the rest of the conversation with Jones including his thoughts on Alexander Gustafsson’s upcoming fight against Jimi Manuwa and why being pushed off the UFC 171 fight card in March was a blessing in disguise. Also on this week’s podcast, Johny Hendricks discusses his new title fight against Robbie Lawler while strawweight fighter Carla Esparza talks about getting a chance to fight in the UFC and who she would like to see coach on the upcoming season 20 of The Ultimate Fighter.